Well it's finally finished and I love it! I really thought I was going to complete it a long time ago but I kinda got in a rut. Last Tuesday I had a false alarm for early labor and that sent Wednesday and Thursday into a super productive get out of the rut and finish the room kinda days. I still have a few unfinished details but I'm really not concerned with them right now...if it happens great..if not life goes on. I do plan on filling the embroidery hoop with his name, birth weight and date once he arrives. Pictures should fill those frames and scripture versus throughout the room. For now it feels complete to me...all it needs is a sweet little baby in there. I will do a post tomorrow on all the details, if there is anything specific you want to know about please let me know and I will do my best to include it in the post. aaaaahhhhhhhhhhhhh!!!!!!!!!! I LOVE it. It turned out just perfect and I can see how it has room to evolve and grow as that little boy grows. Cannot wait to see the nursery and really cannot wait to meet that little man!!! Oh. my. good. gracious. Your masterpiece looks like it came from a magazine! Wow! its wonderfully gorgeous! i LOOOOOVE it. and girlfriend. you've got mad skills hanging those alphabet frames. wow! You have a true gift! It is BEAUTIFUL! It's beautiful! He will love it! Wow, that's your house. It looks like it could be in a magazine. So beautiful. You need to submit it to the House of Turquoise Blog. Robyn, it looks great!! I agree with the girl above---definitely need to submit it to House of Turquoise!! P.S. I'd love to know where you got those ABC frames and prints! SUPER adorable! I wouldnt expect anything other than that! ;) Cannot wait to meet your little guy! What a lovely room for a newborn baby! Seriously this is brilliant!!! I am inspired! Oh! It is fantastic! I Love it! What a beautiful nursery! I would love to know the color you used on your walls. How are you not full time interior decorating for those snooty Brenham women? Print up cards, invite them to see the before and afters of your shabby chic haven, then watch the money roll in. Seriously, you have such an eye. It's truly a gift. If I were sweet baby E I would be in a great big hurry to get into that darling nursery. So pretty!! The alphabet pictures are charming. Just saw your nursery on House of Turquoise. It is so calming and beautiful. I love everything about it! Great job! Could you come decorate my entire house? I mean, you know, between being a wife, mom, delivering your sweet boy and making all that jelly? And I agree with the Locketts - you could have a side business for all the Brenhamites!! 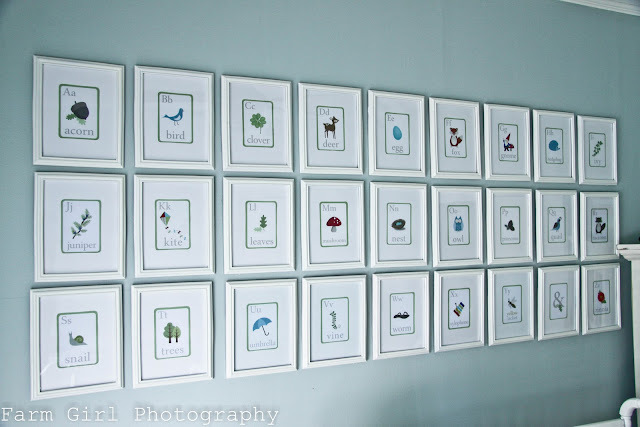 oh, this is so pretty, especially the abc prints and frames. may i ask where you get them? greetings from overseas! Absolutely gorgeous!! What a sweet, sweet place. I saw your nursery over at House of Turquoise and had to come over to tell you just how gorgeous it is. What a perfect nursery. Everything about it is calm and serene. So incredible. I am your latest follower. 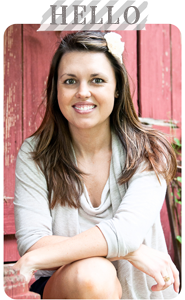 I would love for you to come and check out my blog and follow me back ( and consider adding this post to my blog party so that others can enjoy it as well). Thanks so much. Hope to see you there. Agree with Allison, what color is on the walls? Can I guess - Wythe Blue? I wish you a safe delivery and a healthy baby. Congratulations on your growing family. This is absolutely BEAUTIFUL!!! I have to agree with everybody else you have some true talent girl!!! so pretty!! good job. What is that chevron fabric, I really like it on the curtains especially! This is a beautiful bedroom and saw your room reveal over at the House of Turquoise. I especially love the alphabet picture frames. You have done lovely work in this room. Wishing all the best for the birth of you new baby. Found you via House of Turquoise. Your nursery is just stunning. Well done! Hi! I'm visiting from House of Turquoise and would love to see your daughter's room and the sewing room that were mentioned -- can you post the links? The nursery is lovely! What paint did you use for the room? I love the nursery. You did an awesome job. What a stunning Nursery, I found my way in here via House of T. And I'm the one visiting from Oslo. 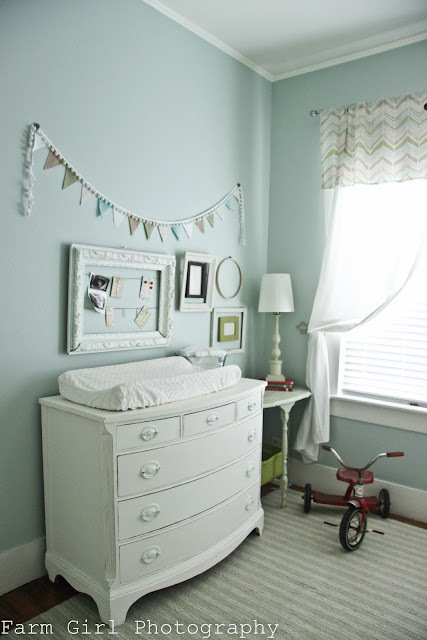 I came upon your nursery via House of Turquoise and it is just lovely! You really have a git for decorating, I love all the details of the frames within frames and the white painted furniture. I LOVE the chest / changing table. WAs that yours or did you buy it at a antique mall. Your little man will love to come home to such a sweet loving nursery. good luck! This is such a wonderful nursery! I love the colors and timeless vibe. I am so impressed with the frame hanging, too! AMAZING!!! I would like to see how you did the pennant that is hanging above the changing table. SO CUTE!! What a FABULOUS room! I jut love it and it has so much character not like the pre-packaged room themes you see so much of for babies. Your design was so well thought out! 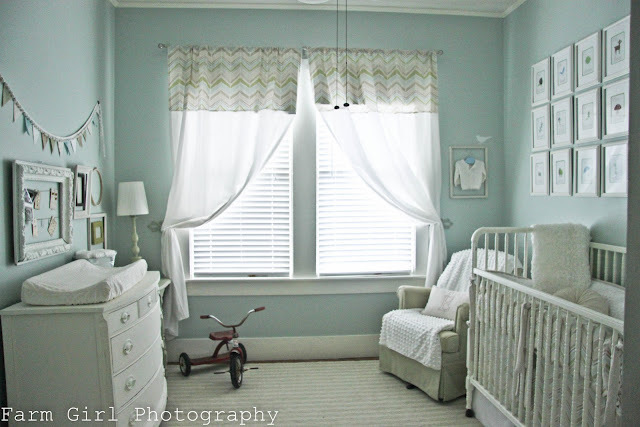 Saw this room through Inspired rooms.. and this is one of the most gorgeous nurseries I've ever seen. Its beautiful!!!! LOVE it. What paint color is that? Gorgeous nursery! You did a fantastic job ;)! 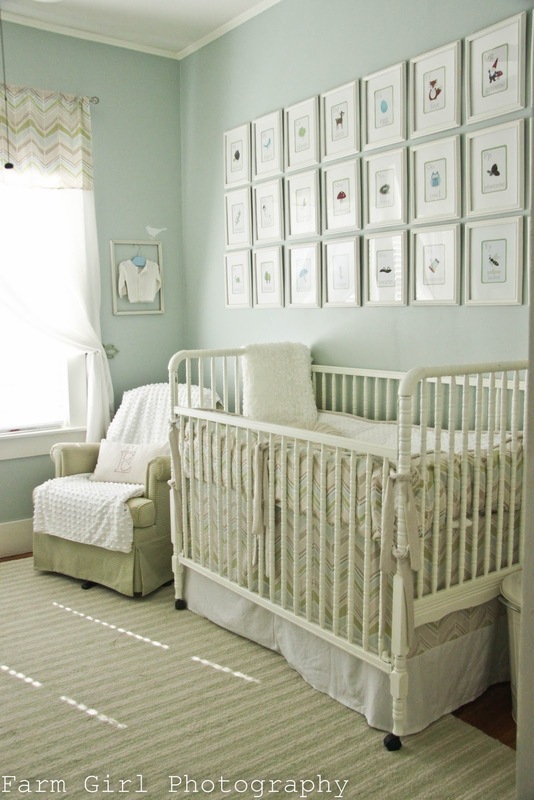 Found your blog via Tip Junkie and LOVE how you decorated your nursery!! I especially love the empty frames that house the little shoes, hanging sweater, etc. Would love to hear more about those details! Absolutely the most wonderful baby room I have ever seen. I love the alphabet wall; it is fabulous!!! I love your nursery!!!! This is such an inspiration for me and my little boy on the way's nursery! Could I ask what paint color you used on the walls? Thank you!! me too..whats the paint color?? I LOVE!!! Love this nursery design so much that I featured it on my "chevr'on my mind" blog post today. It's such a light and airy room, beautiful! I purchased alphabet cards from an Etsy shop about a few months ago and my frames (from IKEA) - but haven't mustered the courage (or time) to actually hang them! Actually I'm having second thoughts about the cards I bought and am debating between two other sets (also from Etsy)! And my daughter is already 10 months old - she'll be a teenager by the time I make up my mind! BTW - I like how you evened out the rows by adding the & - clever! I'm sure since this is 2013 now, the flash cards u used specifically are prob not available, but where did u get them so i can check...was going to do a mural on wall but absolutely love this idea way better. Don't really care for the ones etsy has right now. Love, love, love your nursery! I am due in November and won't be finding out the gender ahead of time. I am very inspired, particularly by your furniture. 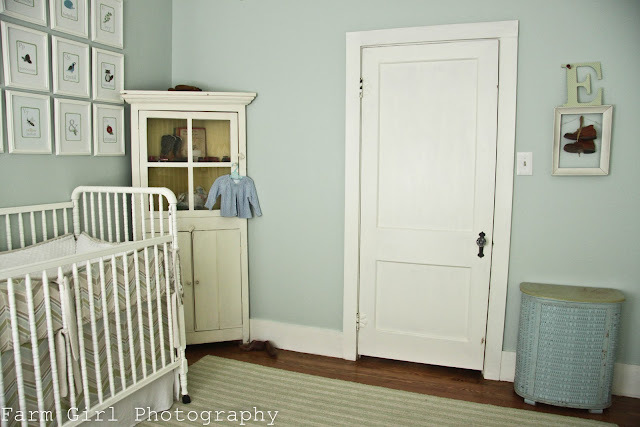 Where did you find your changing table dresser and armoire? Is the armoire a corner piece or just angled? What is the paint color? It is so gorgeous! Love the nursery!! What color did you use on the walls?